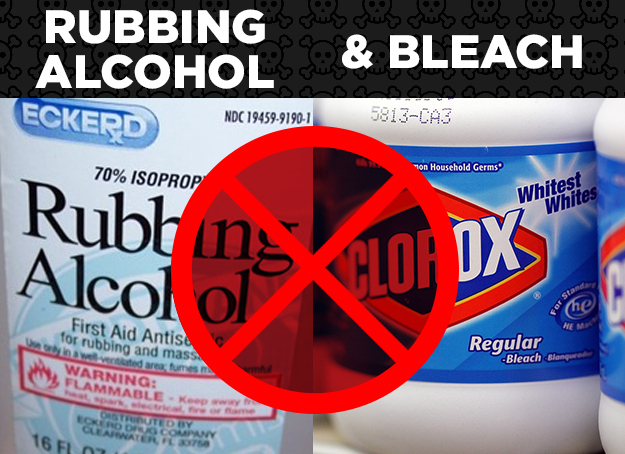 While the combination does create a good disinfectant, these two common cleaning agents should never be used at the same time. 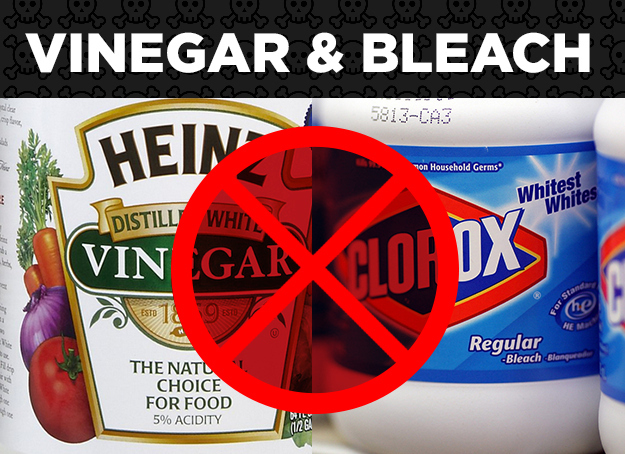 Why: Adding any weak acid to bleach will release toxic chlorine and chloramine vapors. The worst that could happen: You can get a nasty chemical burn, especially of your eyes and lungs. Be sure to check the ingredients lists of your cleaning products to ensure you’re not unknowingly using these products together. For instance, Windex comes in both ammonia and ammonia-free formulas. Certain formulations of Drano contain bleach. Why: Inhaling the vapors could cause respiratory damage and throat burns. The worst that could happen: If ammonia is present in excess, toxic and potentially explosive liquid hydrazine may be formed. Check out this story about a man who died mixing ammonia, bleach, and Drano to clean his toilet. 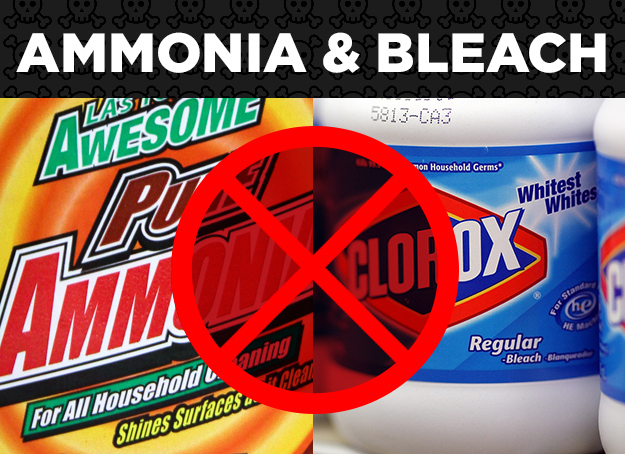 Why: “Ordinary household bleach contains sodium hypochlorite, which reacts with ethanol or isopropyl alcohol to produce chloroform, hydrochloric acid, and other compounds, such as chloroacetone or dichloroacetone.” Read more about the chemistry of these two household products here. The worst that could happen: You could damage your nervous system, eyes, lungs, skin, liver, and kidneys. Extremely high levels of chloroform exposure may result in death, while lower levels could result in dizziness and nausea, according to the EPA. These two ingredients are commonly touted as natural cleaning methods, but combining the two in the same container could result in a corrosive acid. 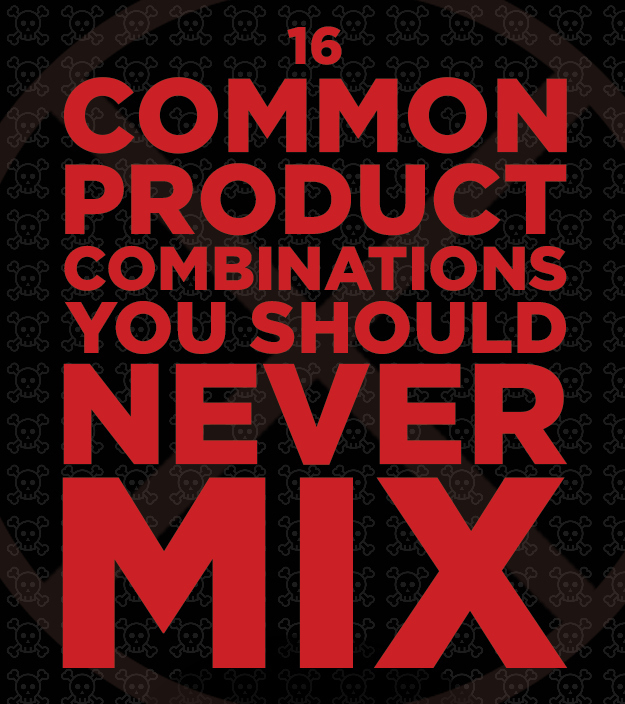 Why: You can use them on the same surface separately while cleaning, but don’t mix them in the same container. You’ll create paracetic acid which, despite being an effective sanitizer, is potentially corrosive and irritating. Read more here about how to properly use these two products in your household cleaning routine. How many times have you seen an ingenious solution on Pinterest touting the magical cleaning properties of baking soda and vinegar? The key is to use these two agents separately, not together — or you’ll end up with nothing. 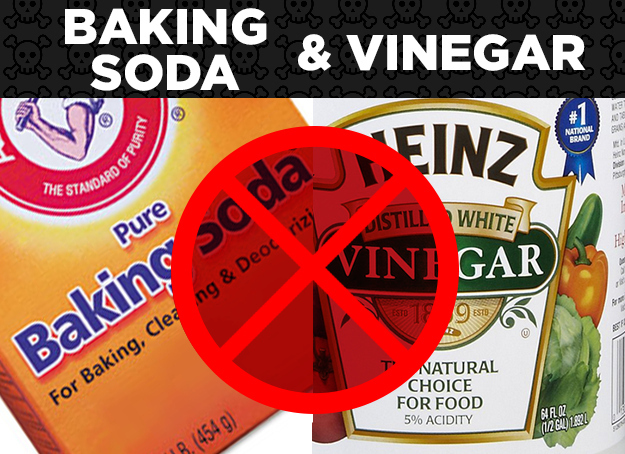 Why: Baking soda is basic, vinegar is acidic. When you put them together you get mostly water and sodium acetate. But really just mostly water. The worst that could happen: you could waste your time cleaning your entire kitchen or bathroom using a solution that doesn’t do anything at all. 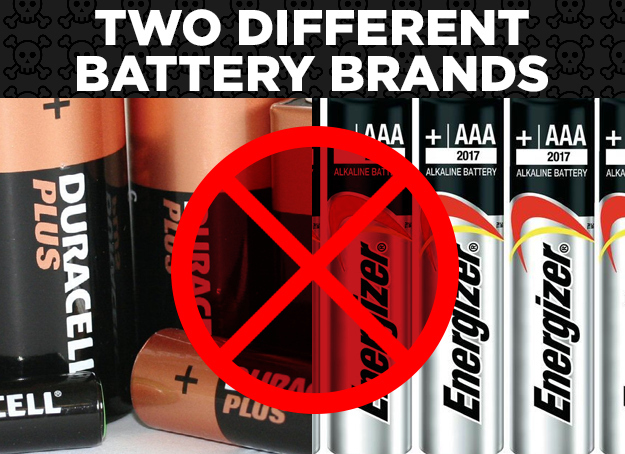 Why: Different battery brands might contain different chemical compounds and varying voltages. When one of the battery dies, the other battery could continue discharging electricity, causing your batteries to leak. The worst that could happen: Leaky batteries could risk damaging sensitive electronic devices. 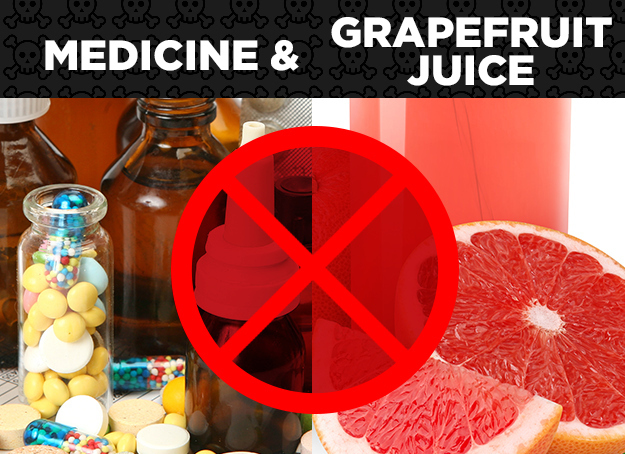 Why: With many over-the-counter and prescription drugs, you risk increasing the absorption of the drug if you take it with grapefruit juice. The worst that could happen: A typical dosage could become a lethal overdose. Why: Chronic alcohol activates enzymes that transform acetaminophen into chemicals that can cause liver damage, even when the medicine is used in moderate amounts. 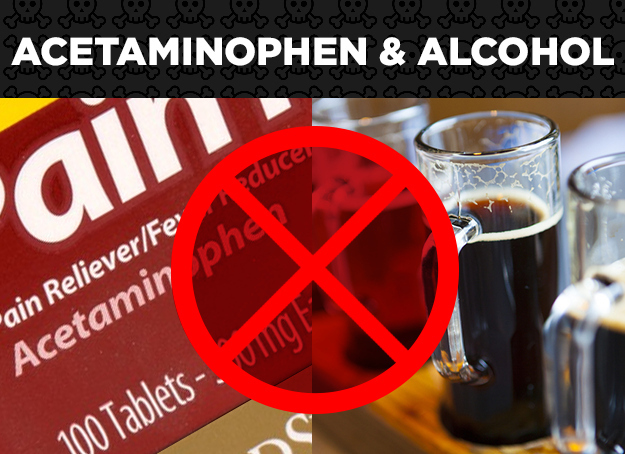 The worst that could happen: Taking acetaminophen after a weekend bender could be fatal if it leads to liver failure. Roughly 200 deaths happen per year due to this lethal combination. It’s one of the grosser science experiments out there: mix ‘em together and the milk rapidly curdles. 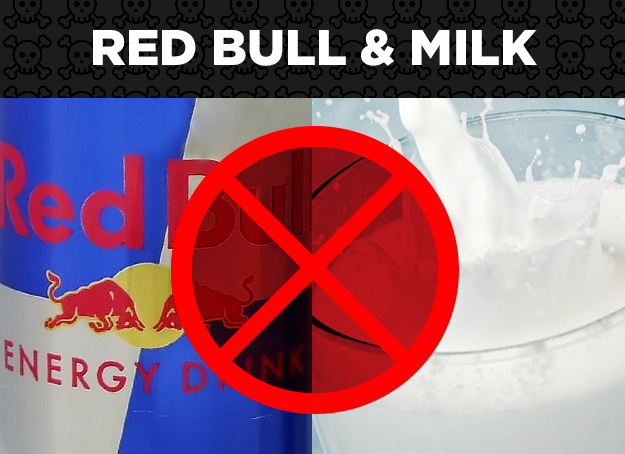 Why: The acid in the energy drink will combine with the milk protein and produces a salt, causing the casein to lose suspension and clump together. The worst that could happen: Weak to average stomachs could have a hard time containing the reaction, resulting in some sort of eruptive vomit. You should always wait 30 minutes in between applying treatments. Why: “Glycolic acids have a different pH than retinol, so when placed on the skin together, the glycolic will take precedence over the retinol and greatly reduce retinol’s activity on the skin,” according to this article. The worst that could happen: If you’re spending a lot of money on anti-aging skincare, you don’t want to render the effective ingredients useless. The combination could also greatly increase irritation. But your skin won’t melt off or anything (hopefully). 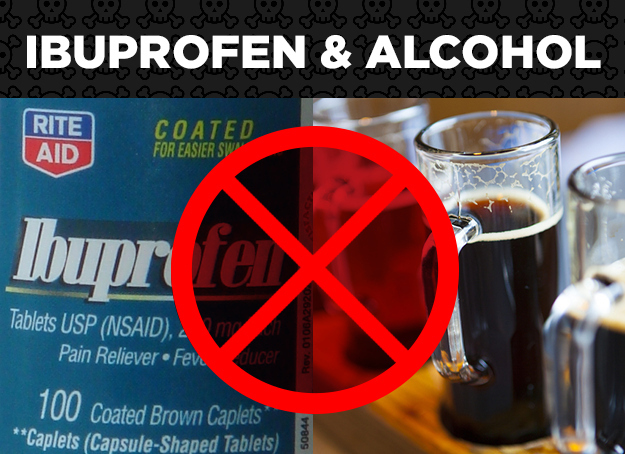 Why: Ibuprofen can cause tears in the stomach lining if taken on an empty stomach. Alcohol only heightens the risk, and it’s especially risky if you’re prone to ulcers. The worst that could happen: It could lead to stomach irritation and bleeding, as well as ulcers and gastrointestinal problems. Most henna hair dyes that purport to color hair any color other than red contains metallic salts. These hair dyes are called compound henna hair dyes. 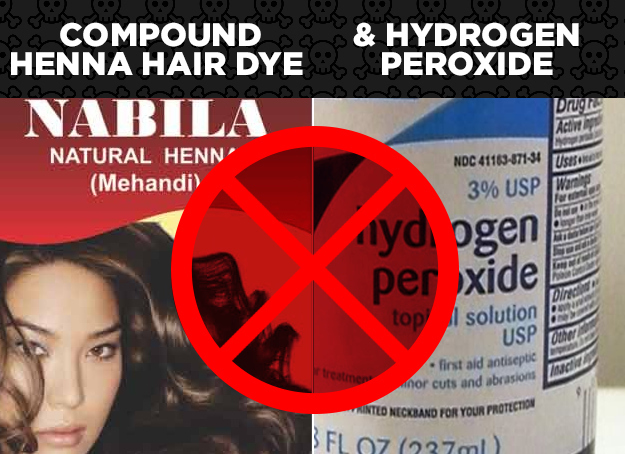 Dyeing your hair with any permanent dye containing hydrogen peroxide up to a year or two after using a compound henna product could result in an adverse reaction, so always test hair dye on a hair sample taken from your hairbrush before applying. 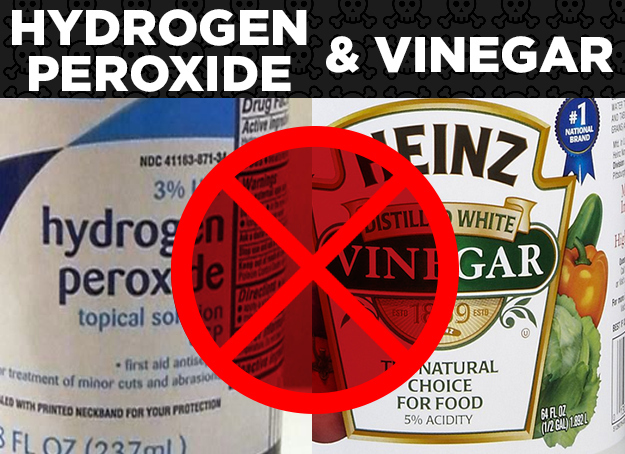 Why: When hydrogen peroxide comes into contact with metalloids or metal salts, a violent explosion could occur. The worst that could happen: A chemical reaction could result in foul odor and smoke, which could burn your scalp. A damaged scalp could lead to increased absorption of the nasty chemicals already present in most permanent hair dyes. If you’re taking both at the same time, you probably want to use a back-up form of birth control. 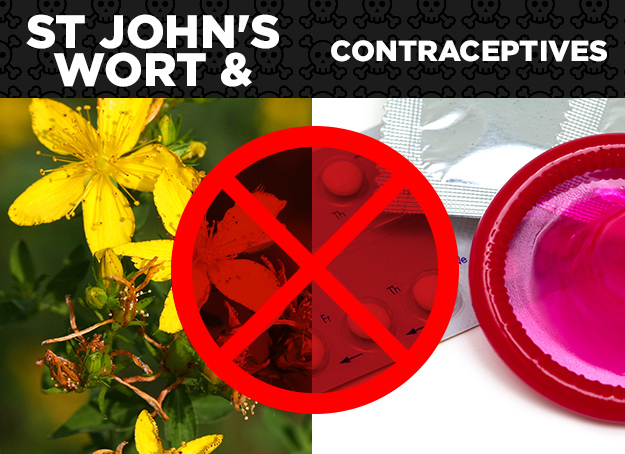 Why: St. John’s wort might increase the breakdown of estrogen, which is a hormone present in many brands of oral contraceptive. The worst that could happen: You could get pregnant. But also, there are other supposed side effects of St. John’s Wort, like increased sensitivity to the sun, and complications with many other medications and treatments such as antidepressants and drugs used to treat HIV. 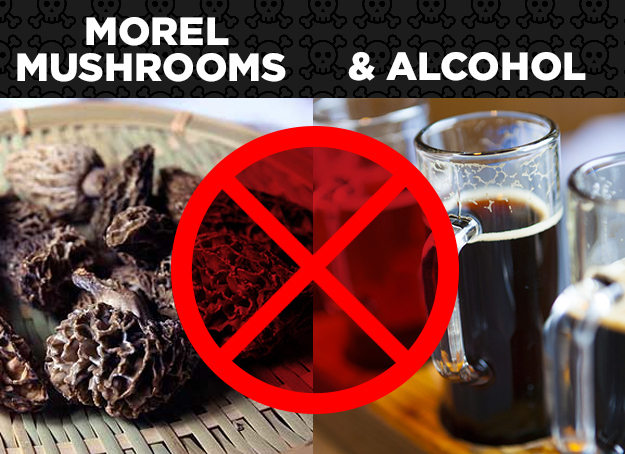 Why: Morel mushrooms should always be cooked thoroughly before eaten because they contain hydrazine toxins, but even cooked morels can lead to adverse effects and mild intoxication when eaten with alcohol. The worst that could happen: Alcohol can exacerbate toxin exposure, which could lead to gastrointestinal discomfort and a sickening, intoxicating effect that could last up to a day. 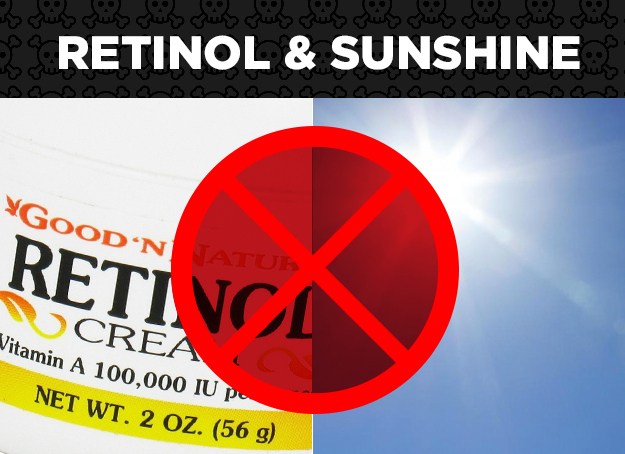 If you use a daytime anti-aging product that contains retinol or retinoids, be sure you’re using an ample amount of sunscreen (preferably one that doesn’t contain retinol). 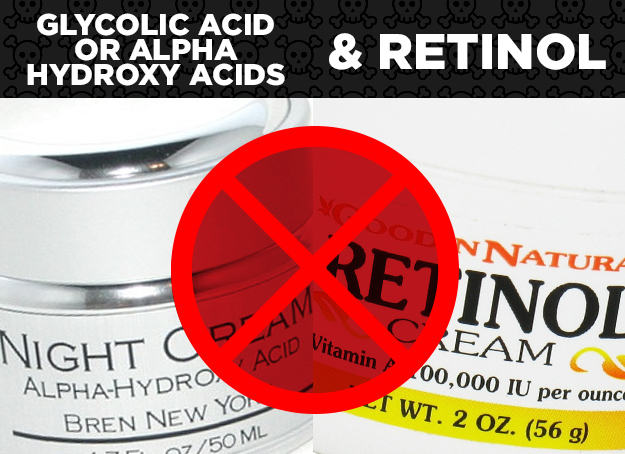 Why: There is some evidence that retinoids can turn toxic when exposed to sunlight. The worst that could happen: While the science isn’t completely solid, the best that could happen is the sun degrades the retinol, lessening the efficacy of your skincare product. At worst, your skin could become much more susceptible to sunburn, leading to a painful, red face. Why: The calcium in the dairy interferes with the absorption of the antibiotic, so it is less effective. The antibiotics to watch out for are fluoroquinolones such as ciprofloxacin or levofloxacin and tetracyclines such as doxycycline. 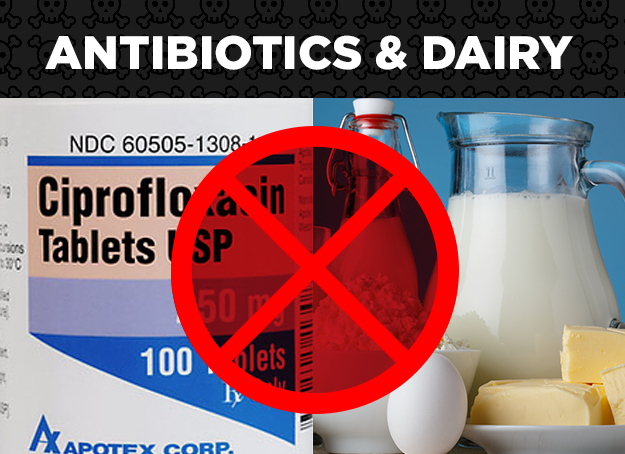 You can still eat meals containing dairy, just make sure you don’t take the antibiotics with the dairy or within a few hours of each other. Read more about it here. The worst that could happen: If you’re fighting off a serious infection, having to go through another, stronger round of antibiotics could wreak havoc on your immune system.